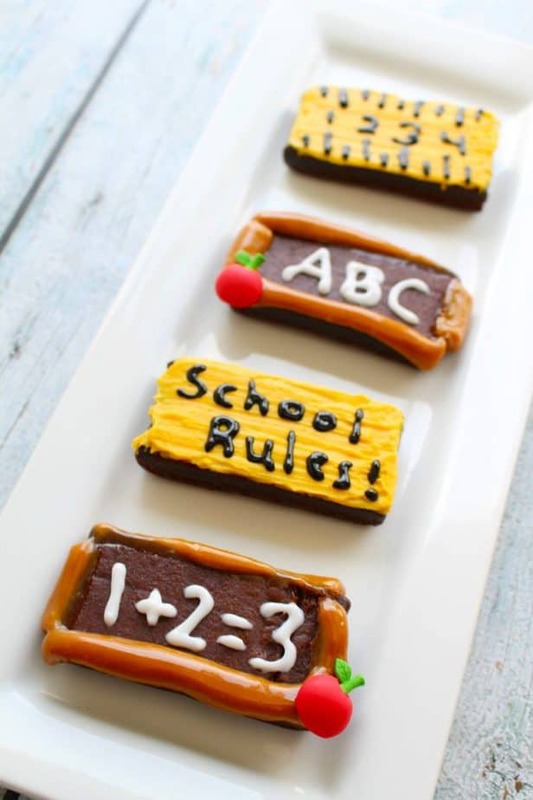 Back to school brownies – this school themed recipe is MMMMMMMM! AND even better – it’s EASY to make! (I PROMISE!) They are NOT as complicated as they look to make! In fact we used prepackaged Little Debbie brownies for our back to school brownies so we didn’t even do any baking! (which means less mess!) We just unwrapped the brownies and started with some basic decorating! Below I’ve included everything we did so you can make your own back to school themed brownies just like ours look above! These back to school brownies are SUPER fun for classroom parties or to surprise your co-workers in your teacher lounge with! 1. Microwave a caramel roll candy piece for 8 seconds and roll out thinner to stretch the lengths of the brownie. You will need 3 caramel candy pieces for each brownie. Once the caramel is stretched (and before it cools), lay on top of the brownie. Once it hardens, it will stick to the brownie. Let each brownie set for a few minutes. 2. With Wilton icing gel, write fun back to school phrases like ABC, 123, etc on each brownie. 3. Add a small amount of ready to spread frosting on the back of the Wilton apple decoration and attach to the caramel part of the s’mores chalkboard. ENJOY! 1. Microwave 1/4 cup Wilton yellow chocolate melts for 35 seconds. Stir until melted. 2. Ice the brownies with the yellow icing and let set for 20 minutes. 3. With a black icing gel, add the lines and numbers of a ruler.